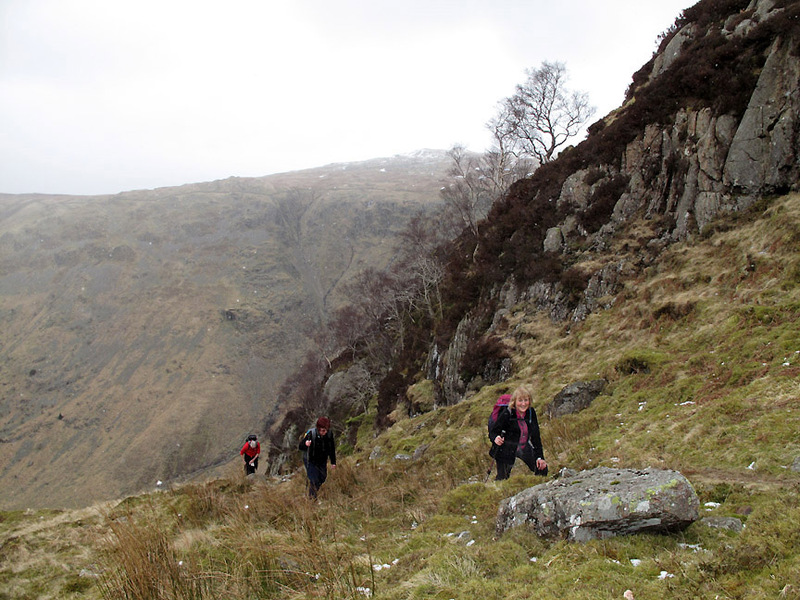 " Eagle Crag, Sergeants Crag "
Date & start time: 14th March 2013, 10.40 am start. 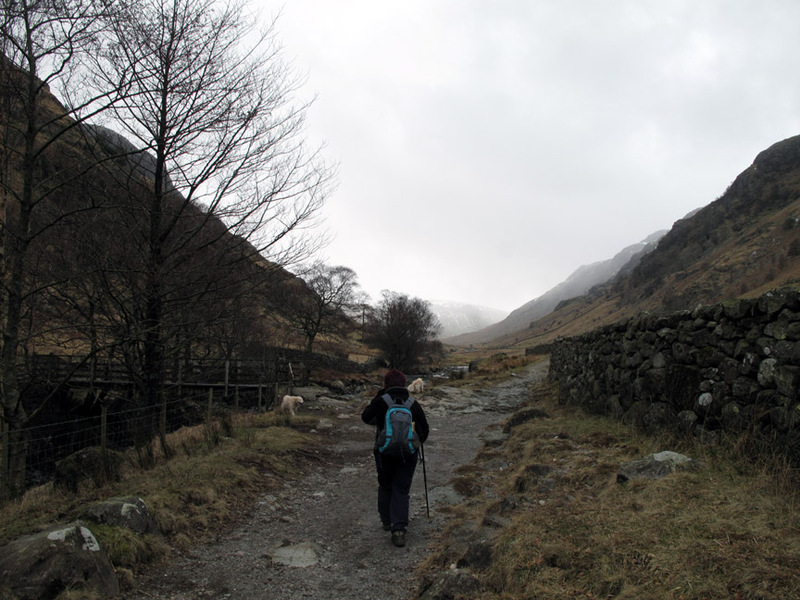 Places visited : Stonethwaite, Eagle Crag, Sergeants Crag, Greenup Gill and back. 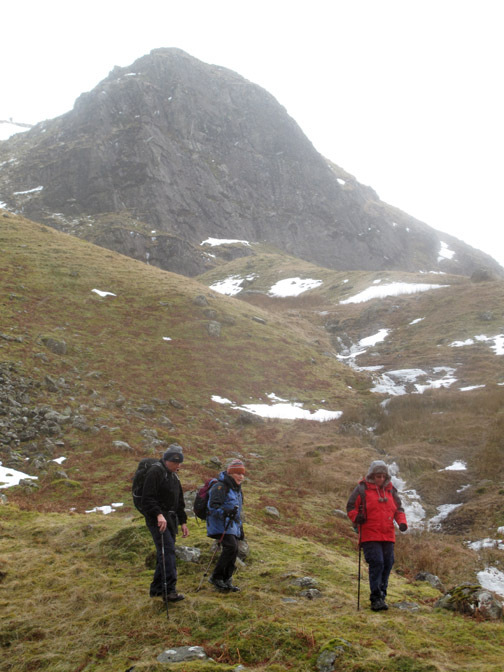 Walk details : 6.2 mls, 1800 ft of ascent, 5 hours 20 mins. 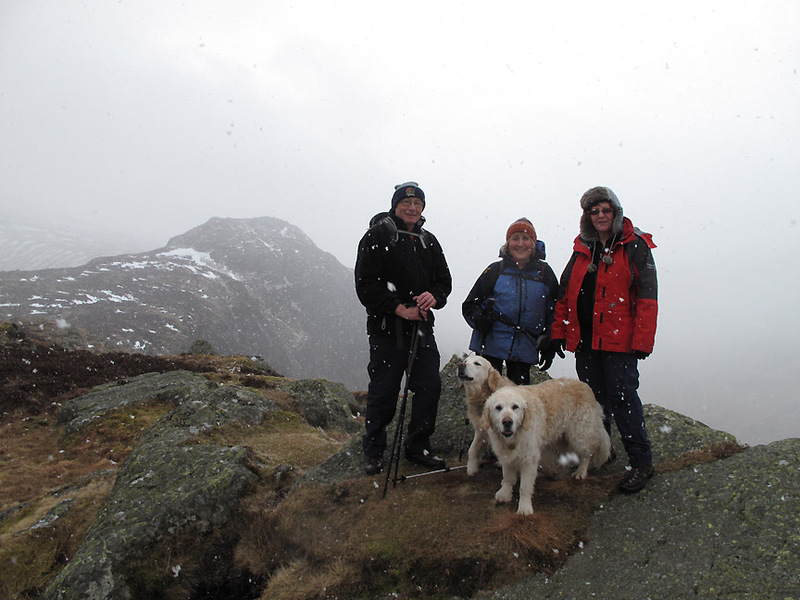 Highest point : Sergeants Crag 1873 ft - 571 m.
Walked with : Bob and Glenis, Ann and the dogs, Harry and Bethan. Weather : Overcast, threatening rain from midday . . . which fell as snow. or wintery showers after midday. 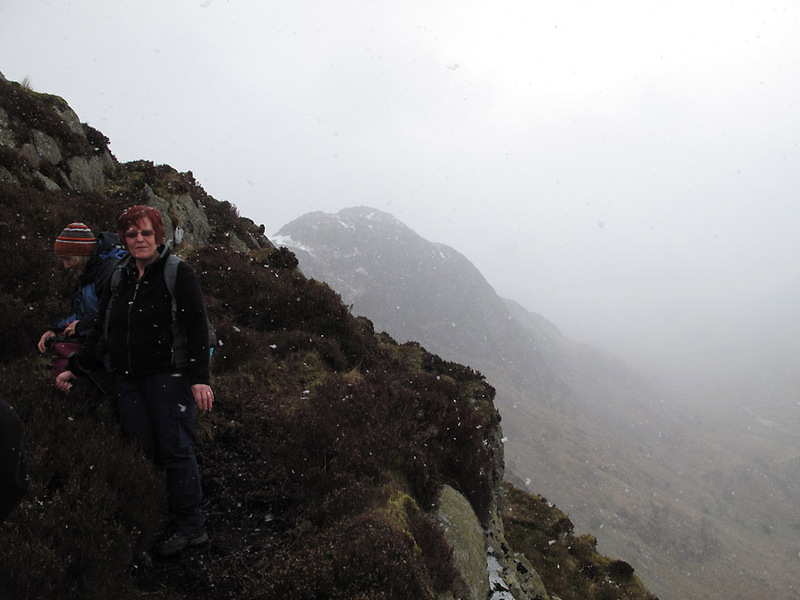 Bob and Glenis were in the area so we met up in Borrowdale for a bit of "up-hill"
. . . just to defy the weather. 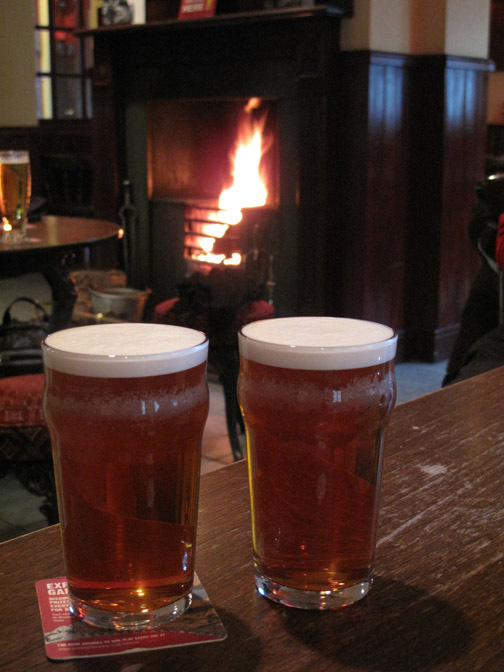 They were up on a midweek break in the Kings Arms Keswick from their home in Preston. so we met up by the red phone box in Stonethwaite . . . not so easy to find as you think because it was covered in green ivy. 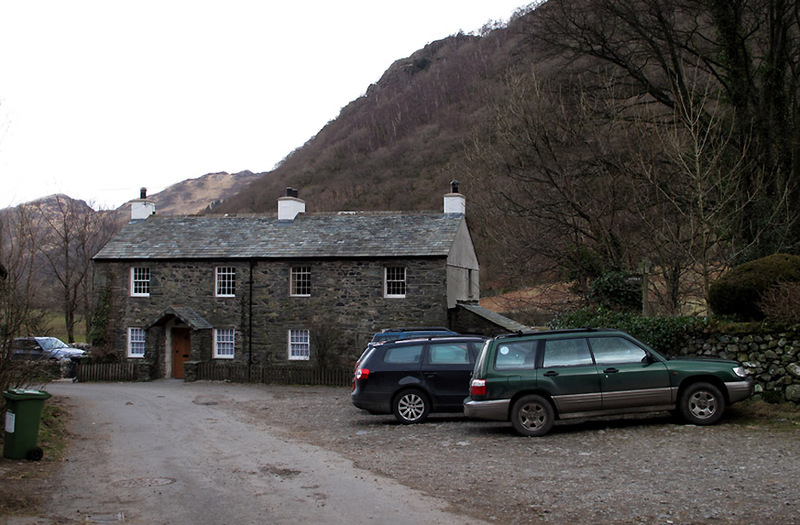 The Langstrath Hotel and the tearooms to the right. 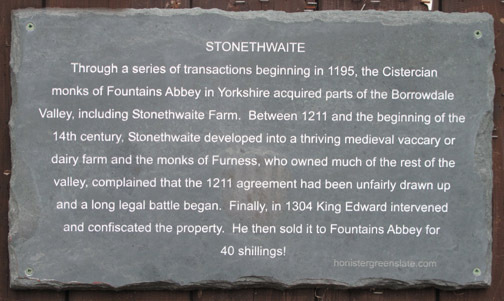 A little local historical politics is recalled on a slate plaque on the barn opposite the old cottage. 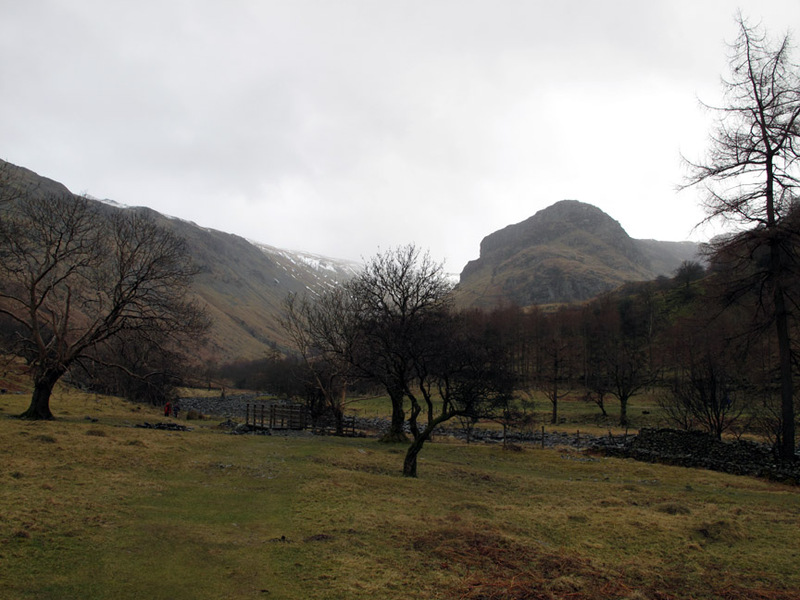 We chose the field path on our walk up towards Langstrath, in preference to the gravel track. Beyond the campsite there's a delightful wooded section alongside the river. Hold your cursor over the picture to see our planned route. 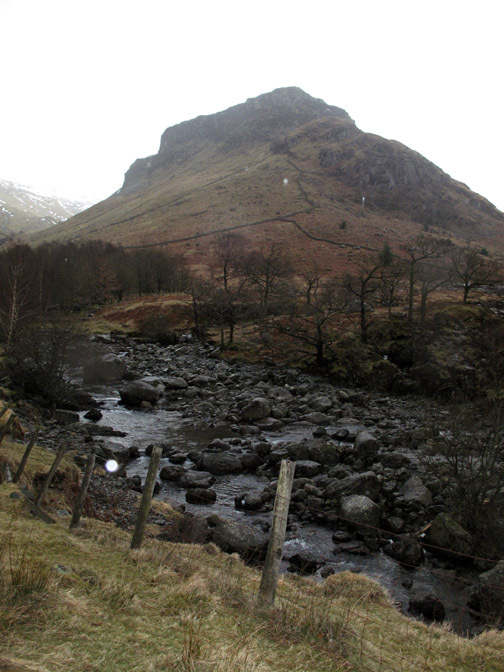 Langstrath . . . the "long valley" in Norse. At the top end there be snow flakes . . . down here it is dry as we turn left over the bridge. 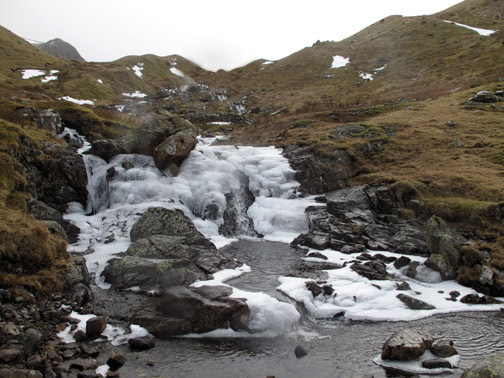 I was all for following the river back down and walking up the Greenup Gill valley to climb the primary Wainwright route. 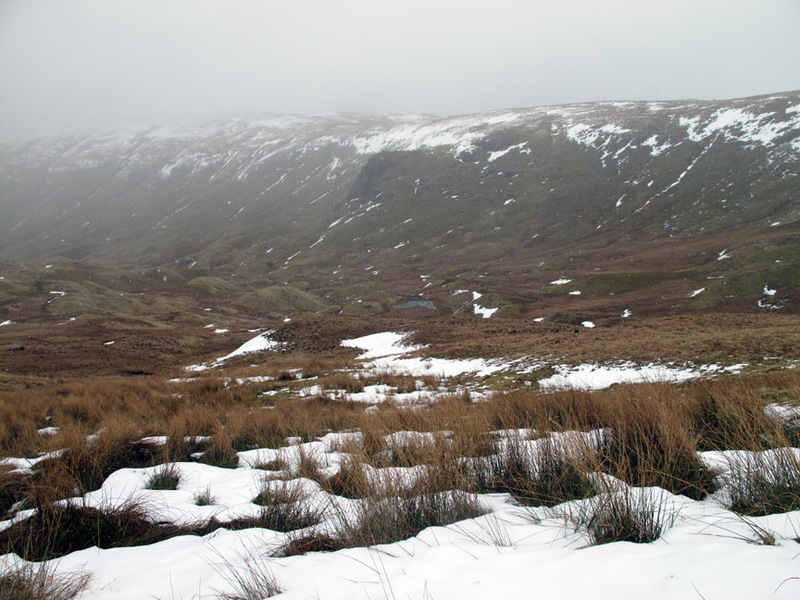 Ann, however, set off diagonally up the slope for a equally valid 'cut-the-corner' route to join the path higher up on the fellside. 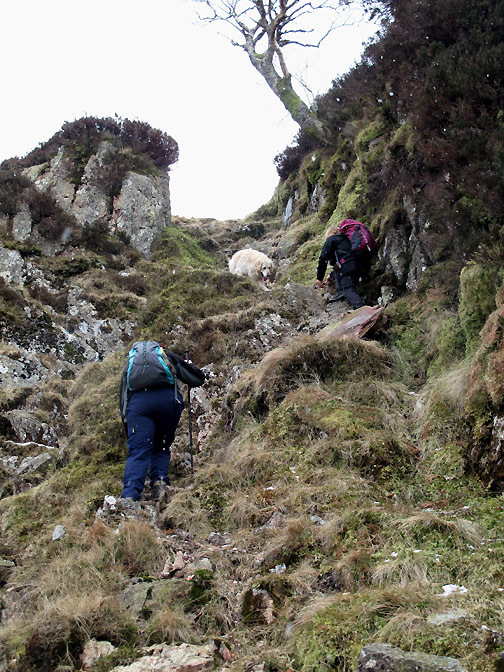 Bob and Glenis follow on as we zig-zag our way up through the winter bracken. 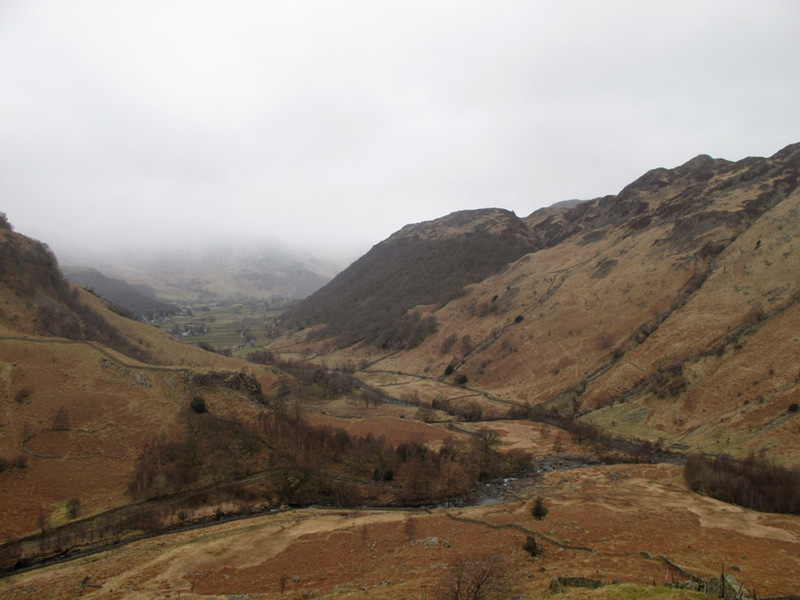 Borrowdale seems to be suffering a change of weather too. The rain / snow showers were not supposed to arrive till late lunchtime. and a little bit more intensely. 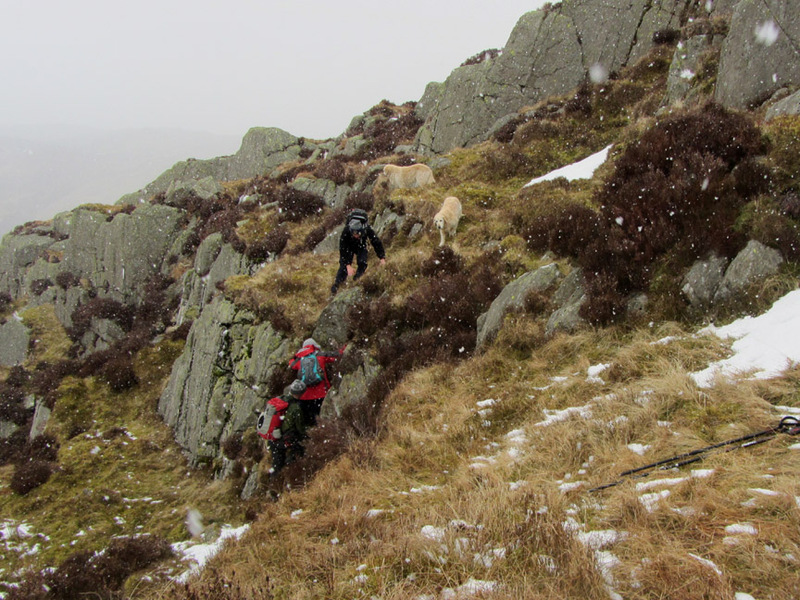 for the direct ascent of Eagle Crag. It is easy to find because it follows on from the first wall . 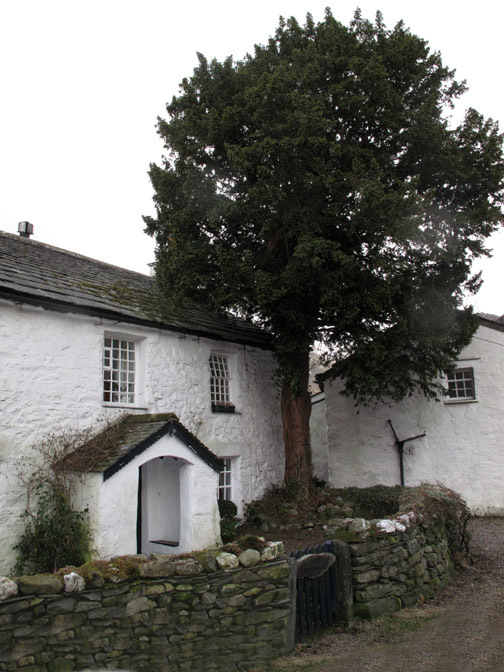 . .
and it has a sheepfold on the opposite bank. high on this side of the fell. The dogs managed to squeeze underneath but Bob climbed over . 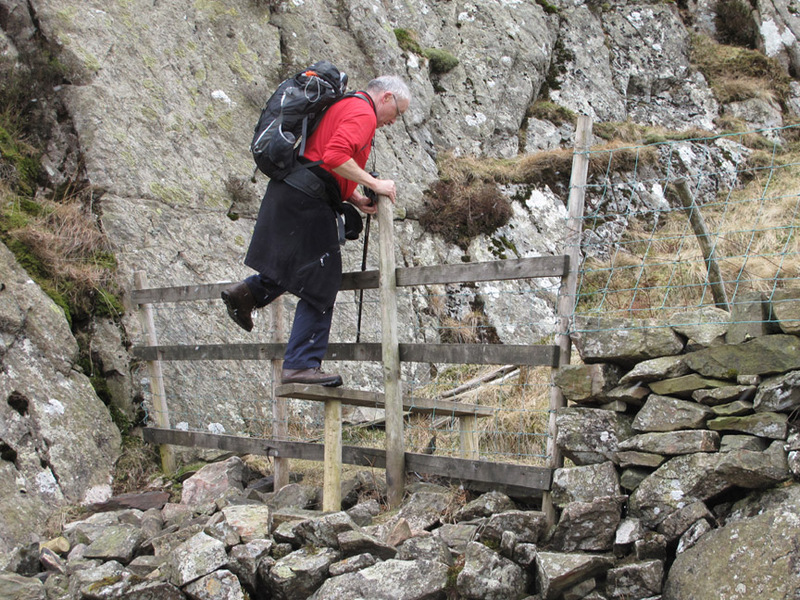 . . hold your cursor over the picture to help him over the stile. Ullscarf on the opposite side of the valley is just clear of cloud but there are signs of the first flakes of snow in the air. 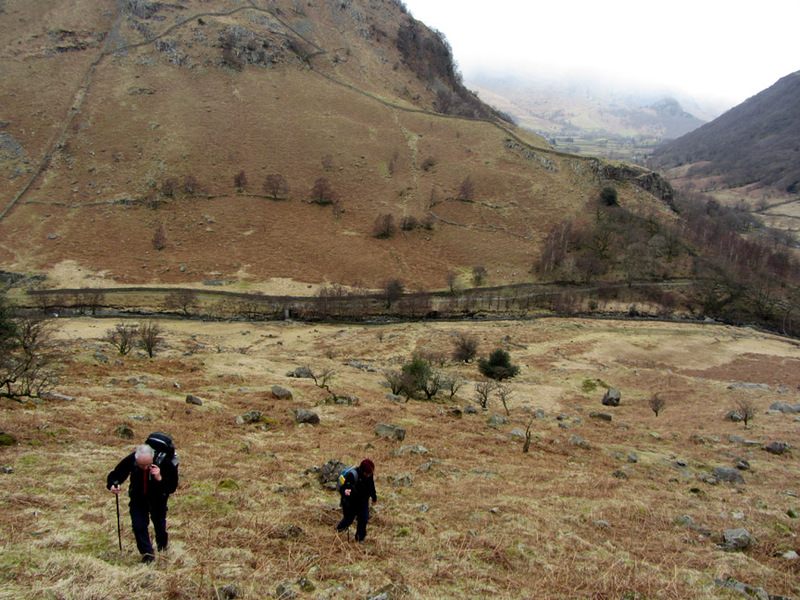 The crux move on this walk involves finding the gully to climb. Look for the cliff . . . but it probably won't have icicles on it. 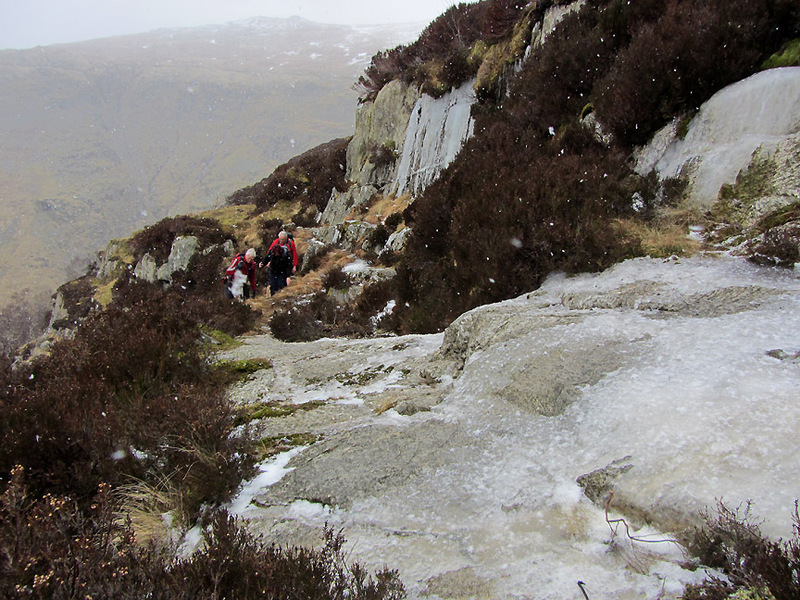 Sheet ice on the path made the ascent of the gully slightly more of a challenge than planned. 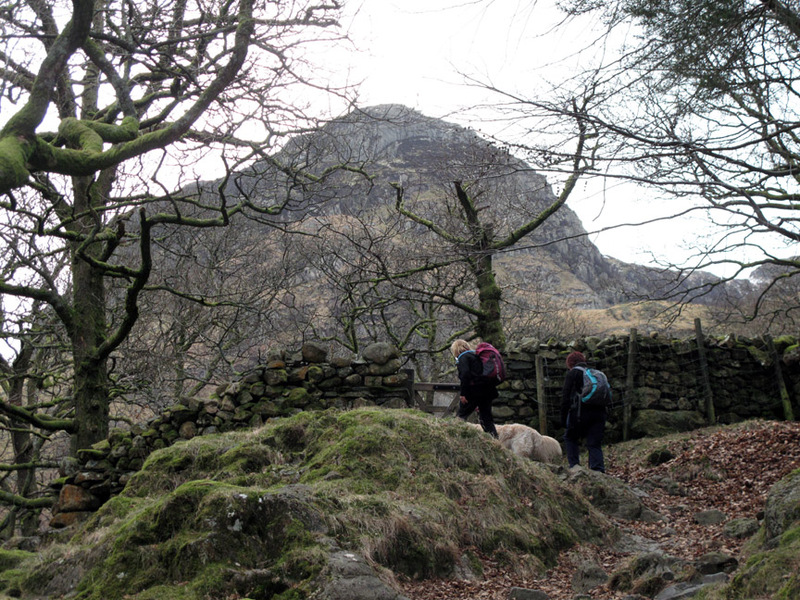 Bethan looks on as we reach a tricky bit. Up above it is more open . 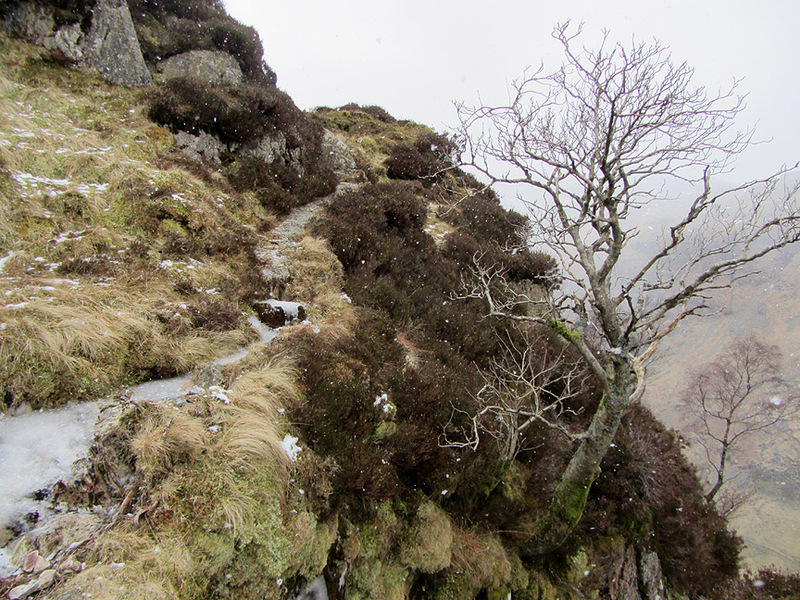 . . but the path itself is definitely out-of-bounds due to the cold temperatures. There is sufficient room to the side however and we progress up without needing to put on our 'spikes'. The grey bits are rock and easy to walk . 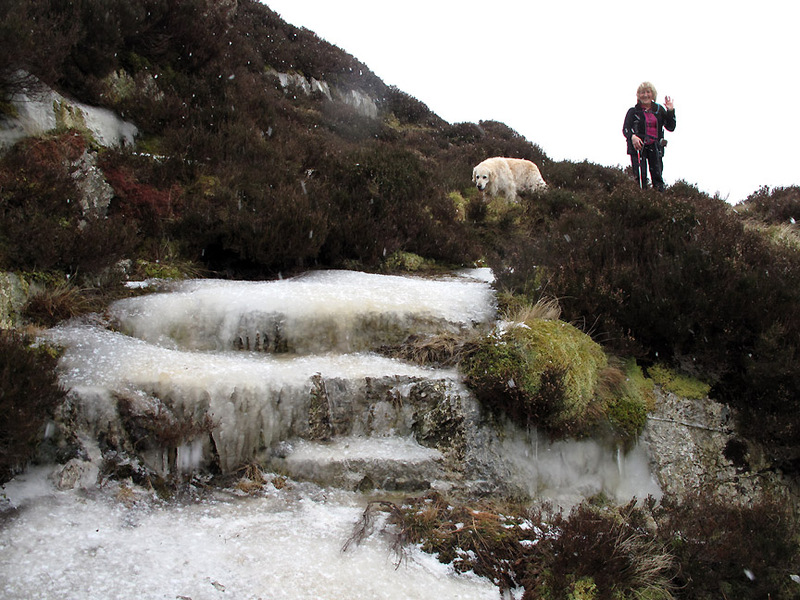 . . the white bits are ice and not quite so easy ! 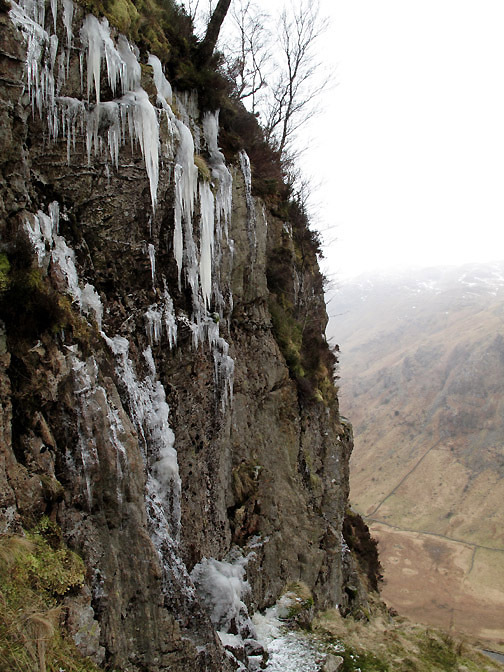 The frozen waterfalls of Eagle Crag . . . Hi Ann ! 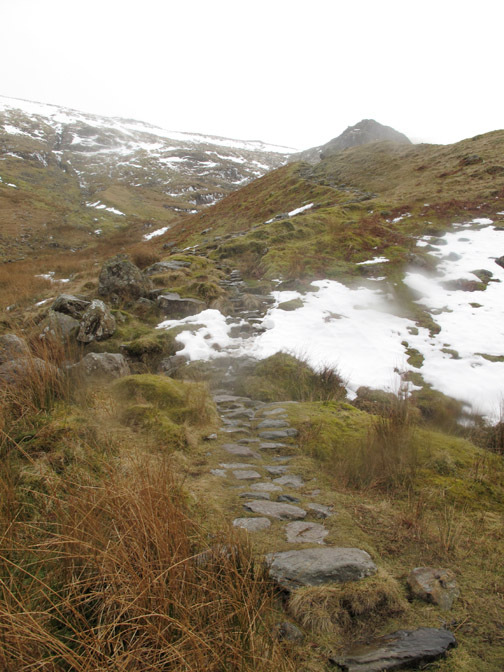 With the normal path often iced over, a little ingenuity was needed at times to continue our upward progress. 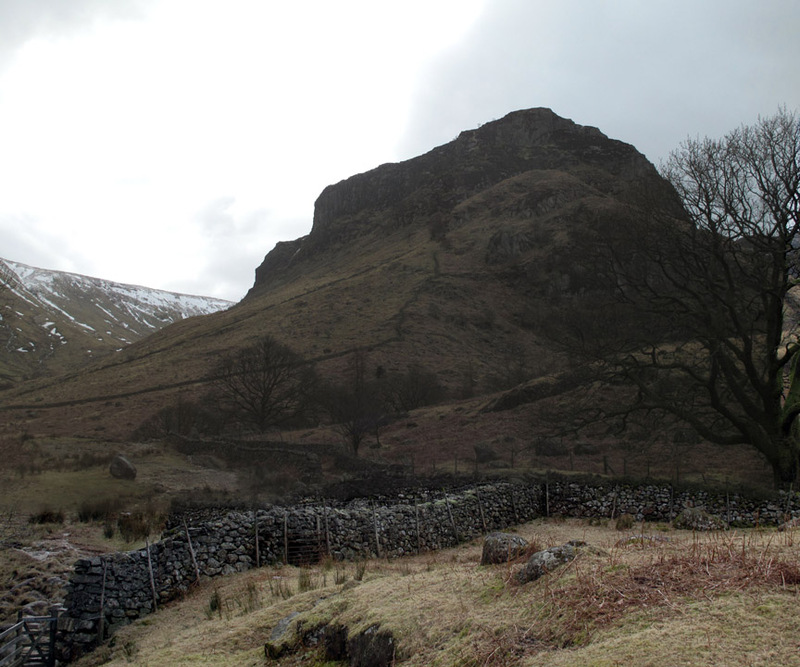 First view, from this level, of Sergeants Crag. Our route wound its way left and right, climbing and traversing as required. Serious stuff it seems as Ann continues upward. 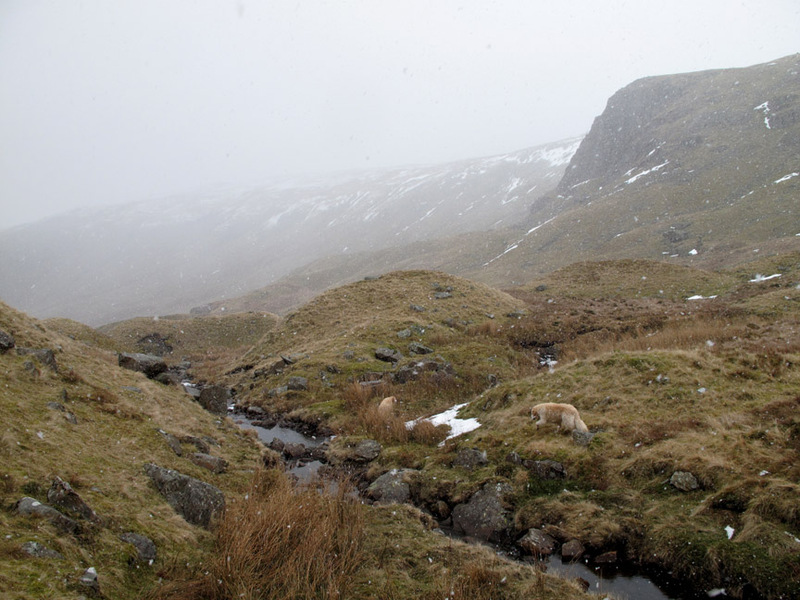 Below is the lower section of the Langstrath valley, downstream from Blackmoss Pot. Undaunted by the complex route . 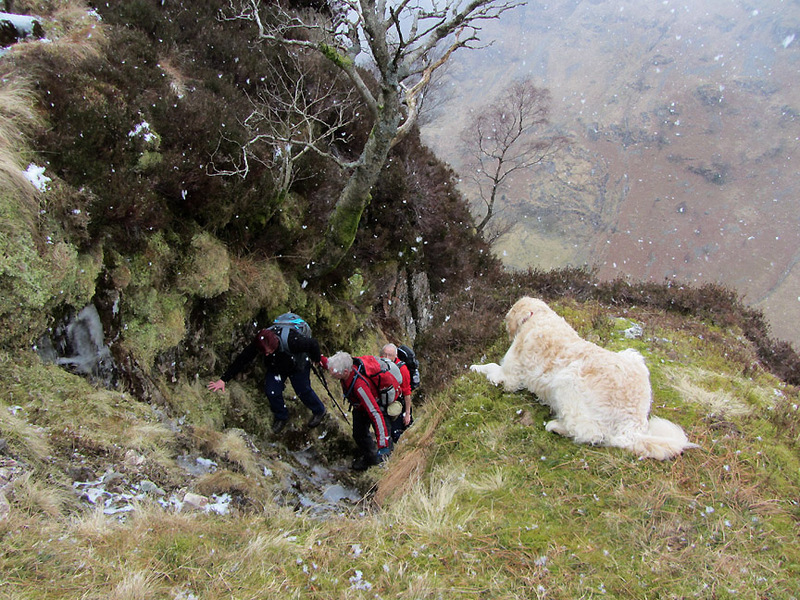 . . we successfully summit out on Eagle Crag . . . a good achievement today. 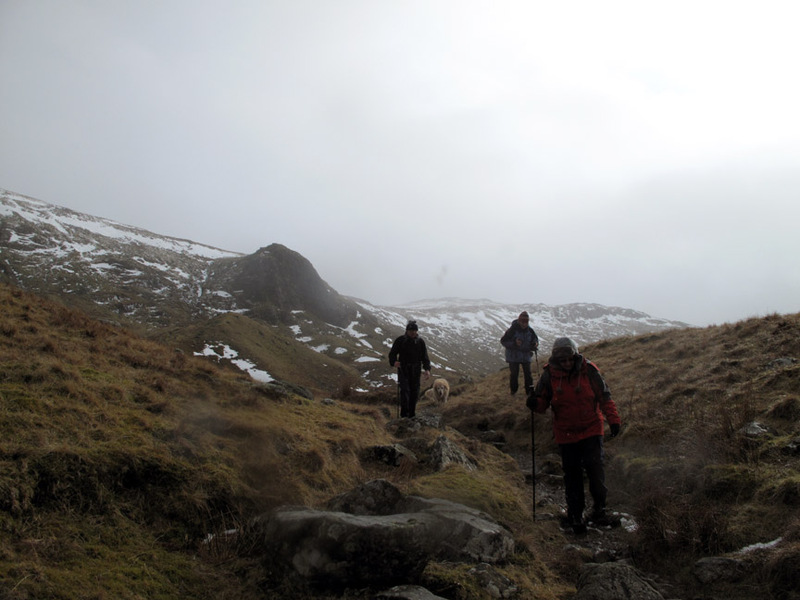 We defer lunch in favour of the ridge walk to our next summit . . . Sergeants Crag. Serious snow flurries now . . . but it is cold enough not to melt and make us wet. Windproof tops or fleeces were as good as Gortex jackets at this time. Sergeants Crag . . . time for lunch . 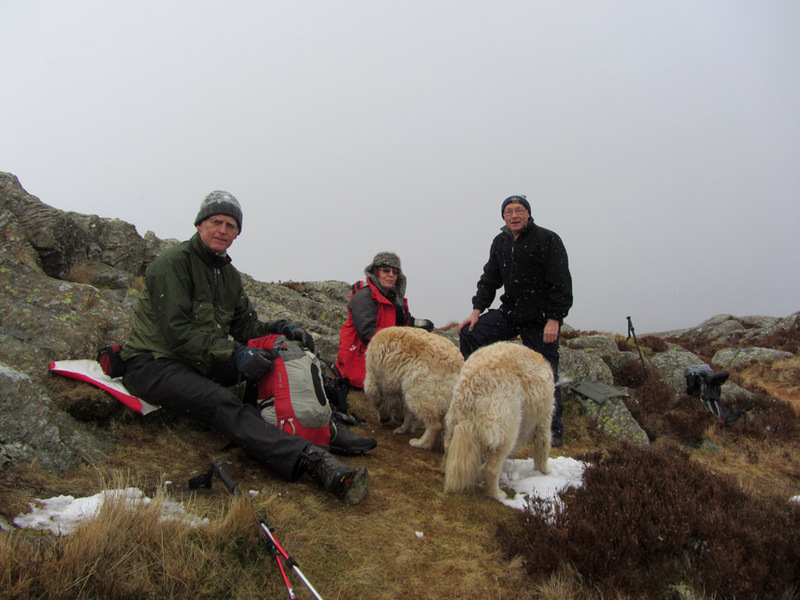 . . or rather, a post-lunch photo as we were putting our gear back into the rucksack ! From Sergeants Crag it was downhill all the way. Where shall we go now ? 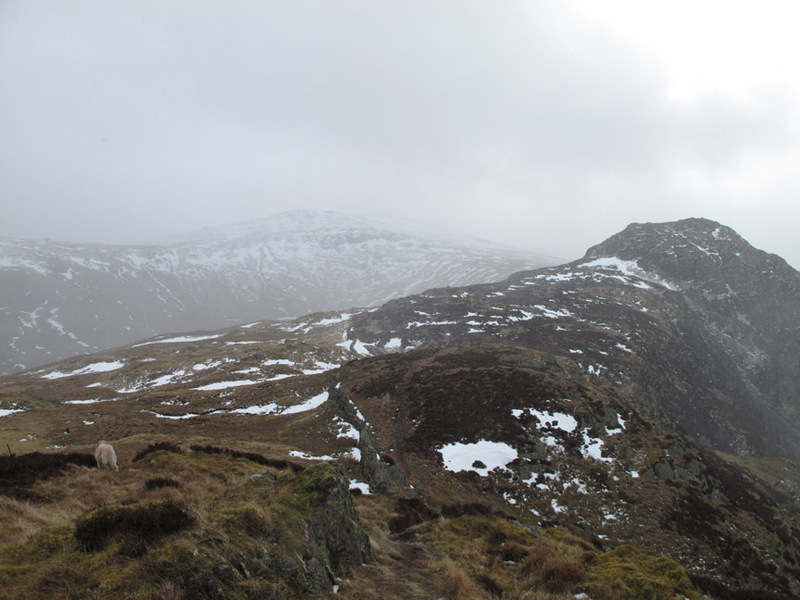 Our two summits achieved, it was a matter now of a simple descent. Should we cut straight down to the left . . . or head out towards High Raise and take a more circuitous but gentler route down ? We took a wider circuit and headed down a drier looking grassy ridge . 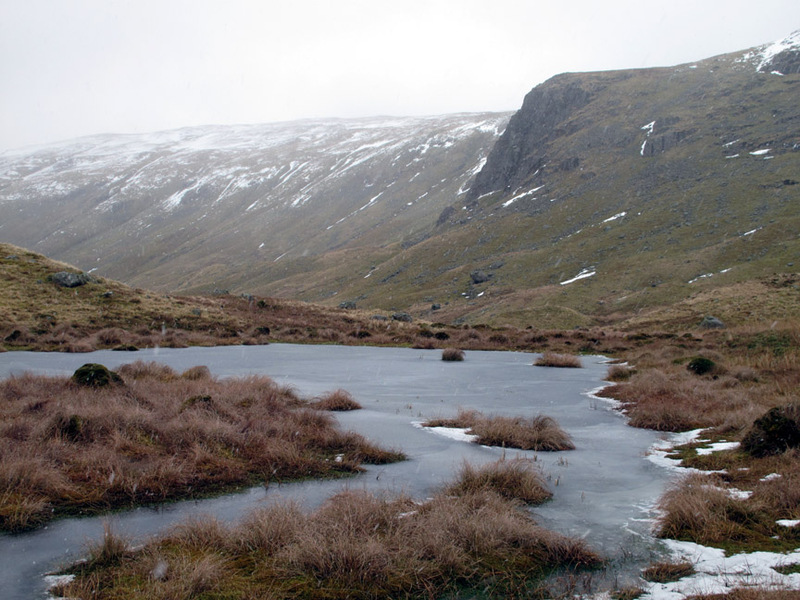 . . towards that small tarn. 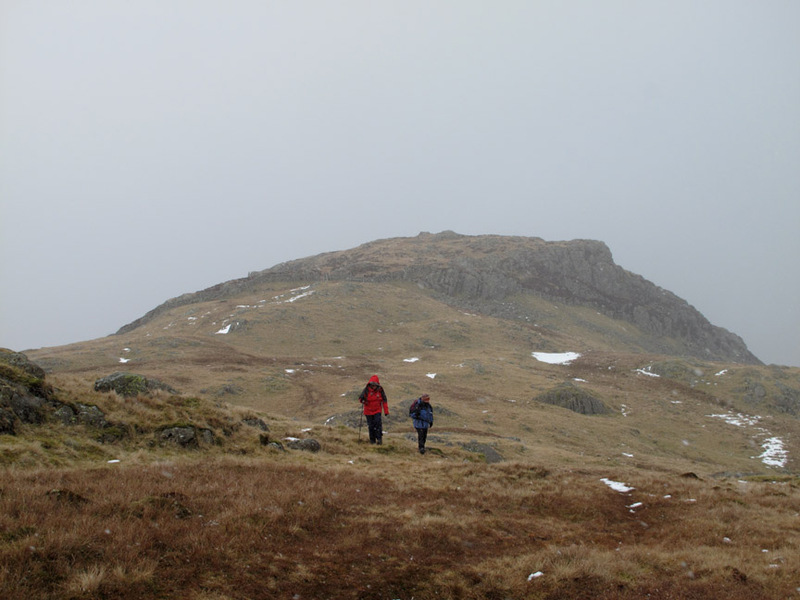 Beyond the tarn, the steep cliff of Lining Crag, the way mark for the start of the climb over Greenup Edge towards Grasmere. We enter the flatter part of the valley where the glacial moraine forms drumlins and rounded deposits of alluvial stones. 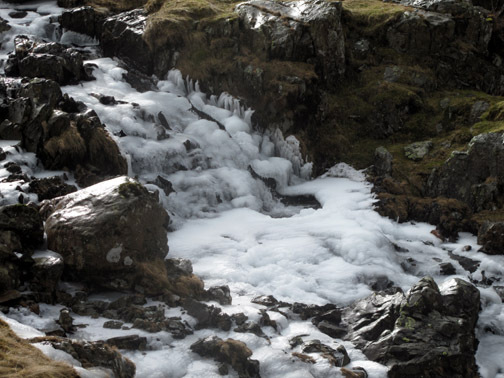 Classic Glacial geography . . . might even write a book . 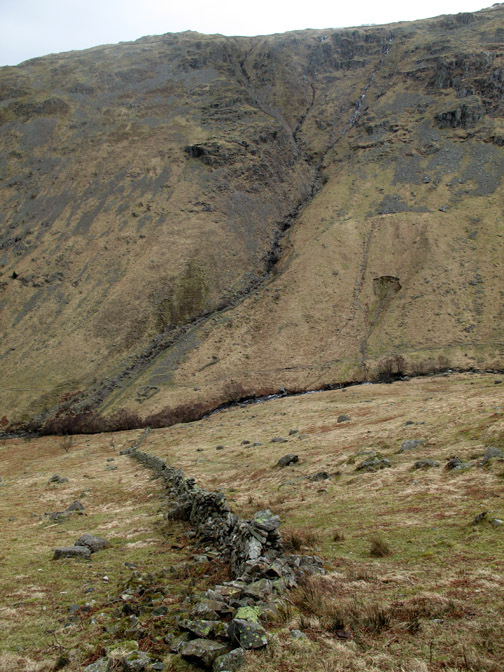 . . Lake District Mountain Landforms might be a good title ?
. . . but someone has done it already ! Click here for details of Peter Wilson's book. 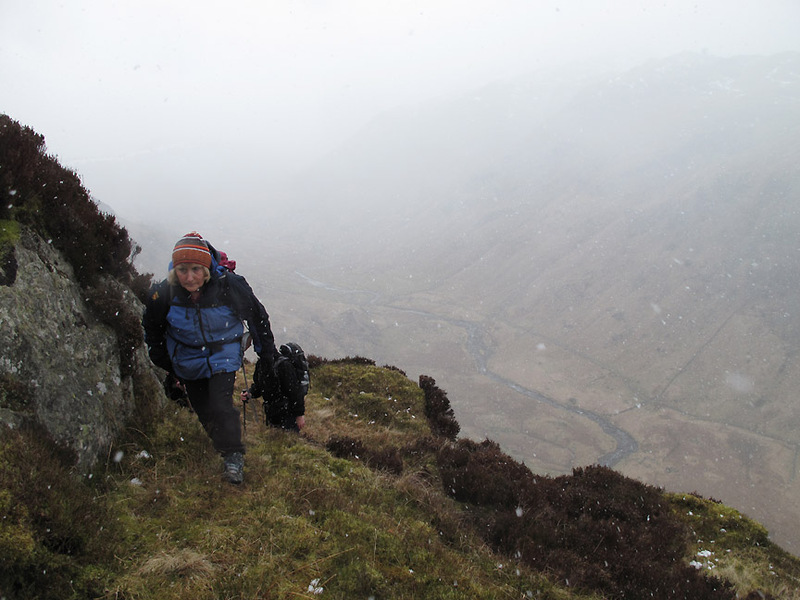 The dry snow flurries are turning quite damp as we descend. The Greenup Edge path is reached on cue. 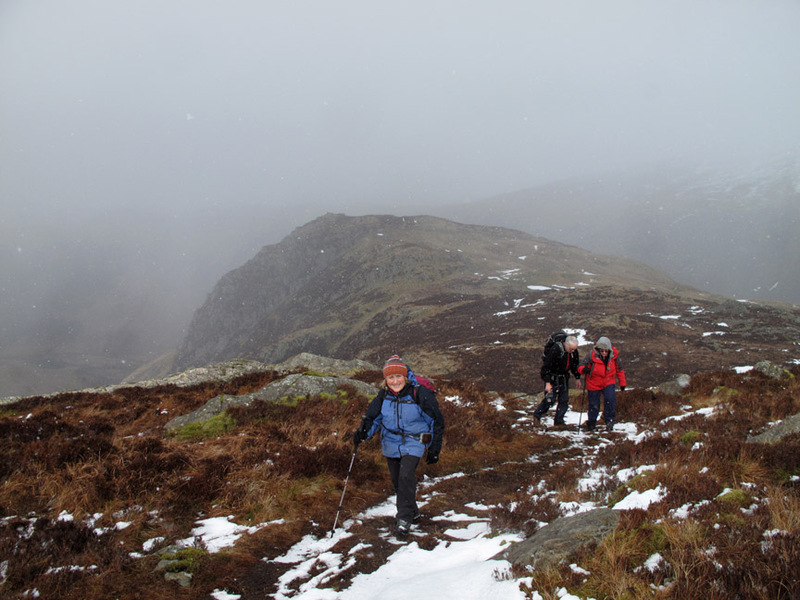 Dampness on the lens proves the slight change of the weather as we continue on down the Greenup Gill Valley. Behind us Lining Crag is getting smaller by the minute. Chill water sufficiently it turns to ice . . .
. . . and forms delightful effects on the side of the stream. 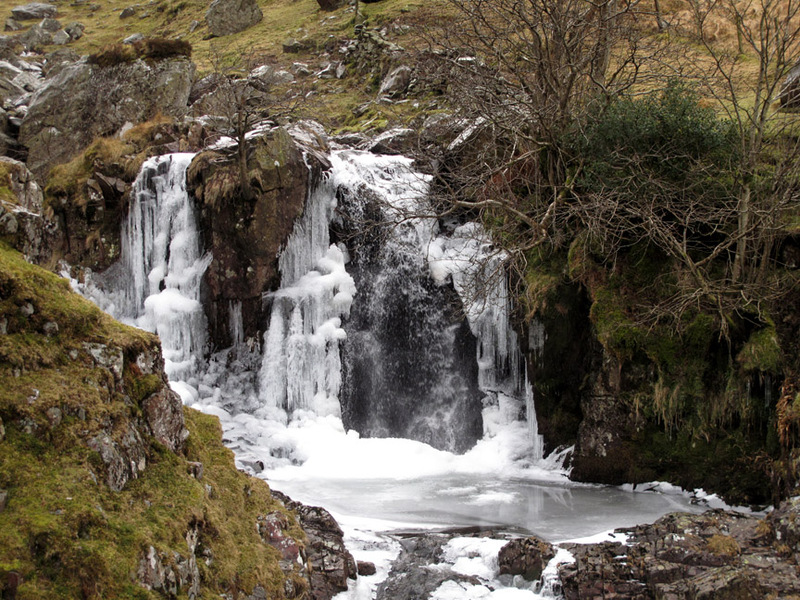 Low down the amount of water is greater and the ice falls more spectacular. Back to the out-take wall . 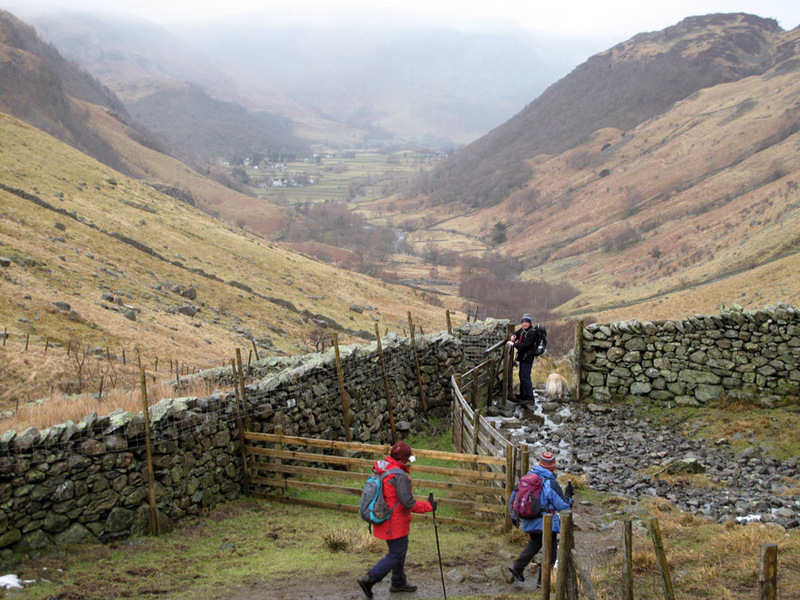 . . looking down once again at Borrowdale. 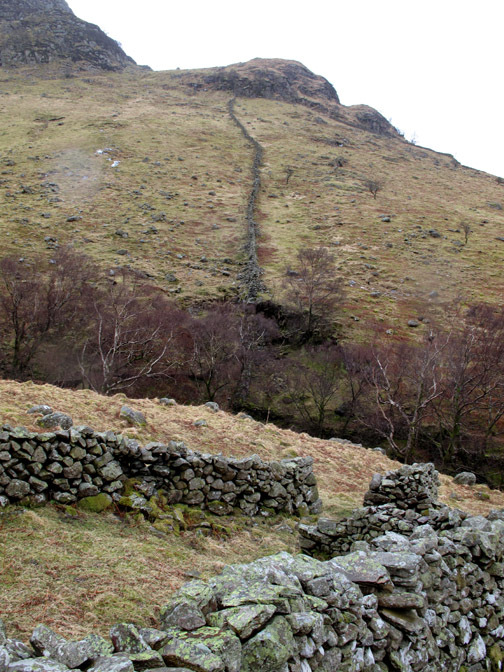 The 'second wall' seen from the sheepfold. 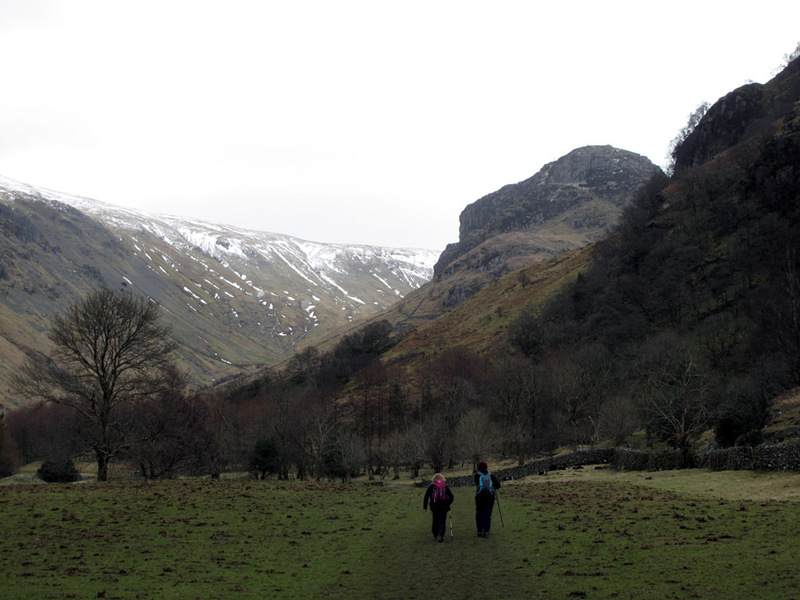 Looking back at Eagle Crag from the main valley. Hold your cursor over the left hand picture to remind yourself of the earlier photo. Easy going now as we walk down the valley . 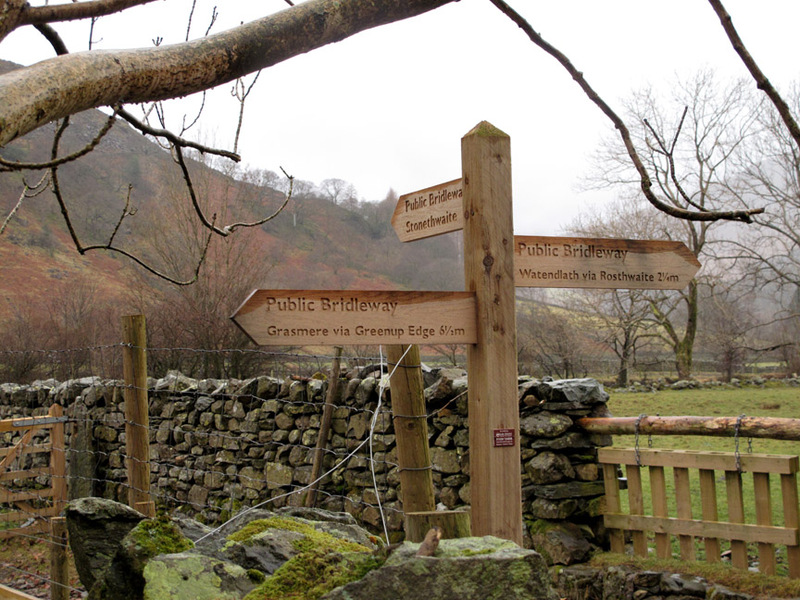 . . back to Stonethwaite. 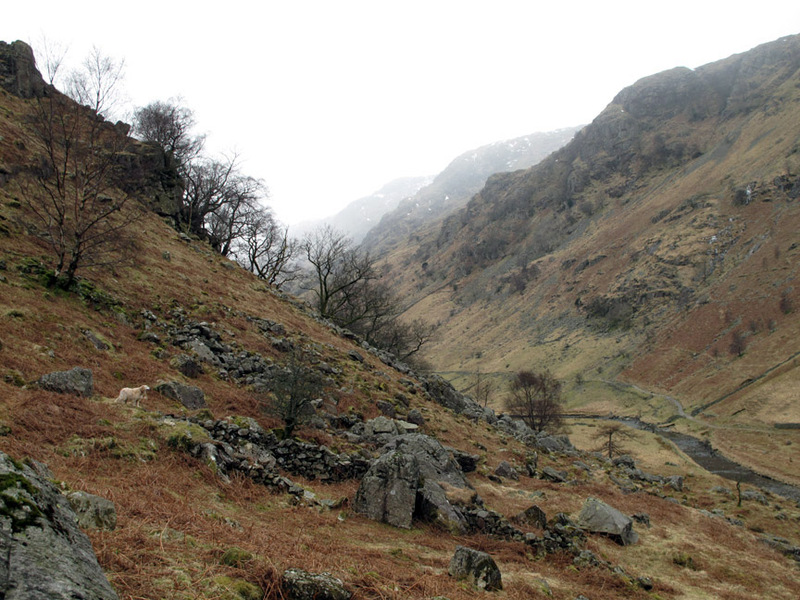 and across to the Stonethwaite side of the valley. but despite being open at 11am they were closed at 4pm. A real shame as I'm sure it would have been very homely. 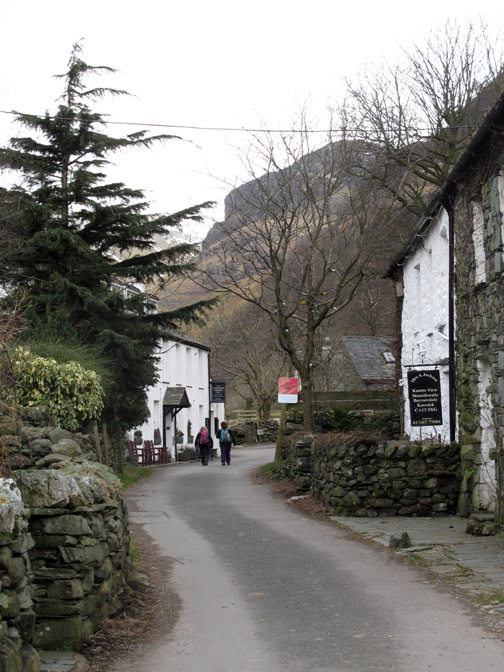 to the Scafell Hotel in Rosthwaite and to the Hiker's Bar. Hold your cursor over the picture to see time pass delightfully ! at the end of a very different weather-day from those we had experienced in recent weeks. Does this mean Summer is over ? Thanks to our companions for a great day out. This site best viewed with . . . an adventurous route in mind.